Officially licensed Ole Miss NCAA mouse pad. This mouse pad features a soft fabric surface with thick neoprene backing. 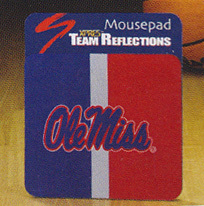 Mousepad measures 9" x 8"
Officially licensed University of Mississippi NCAA 3" x 12" decal strip. Decal strips can be placed on a variety of surfaces, not just a bumper, with their self-adhesive back. Made in USA. University of Mississippi Ole Miss - NCAA Laser Tag / Mirror License Plate. Officially licensed NCAA 6" x 12" acrylic mirror license plate with University of Mississippi Ole Miss team logo laser engraved in the center. Made in the USA. 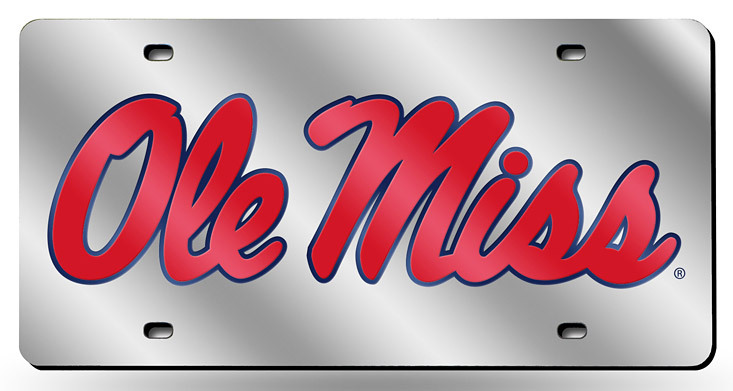 University of Mississippi / Plastic License Plate Frame, by WinCraft. Officially licensed plastic NCAA license plate frame, usable as a fan decoration on the outside of a standard car license plate. The University of Mississippi frame is molded in durable plastic and is designed around the California standards for tab and sticker clearance. Made in USA. University of Mississippi - Ole Miss NCAA Car Flag. 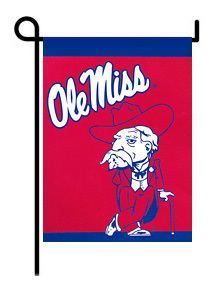 Officially licensed University of Mississippi Ole Miss two-sided NCAA car flag, with wall mount. 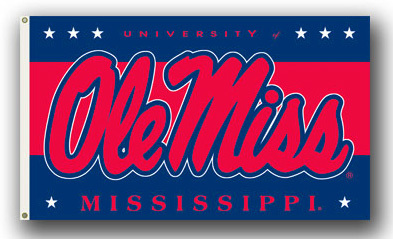 Car flag measures 11" x 18"
University of Mississippi - Ole Miss NCAA 3' x 5' Premium Flag. Officially licensed University of Mississippi NCAA flag made of heavy-duty polyester, with 2 heavy-duty metal eyelets for flying outdoors. This Ole Miss flag makes a great wall decor indoors. 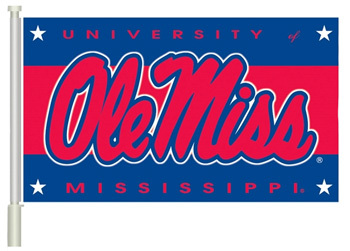 University of Mississippi / Ole Miss - NCAA College Garden Flag, by BSI. Officially licensed University of Mississippi Ole Miss NCAA two-sided 13" x 18" garden flag. This 2-sided premium garden flag is made of high quality polyester, with a liner for clear visibility from both sides. Includes a plastic pole and suction cups to display your flag in a window. The metal garden display pole is sold separately.